Awe the birds inspire me so! Here in the Pacific Northwest of the United States we are usually blessed with mild winters. My apologies to the frozen regions! Hummingbirds linger through our winters if their human friends faithfully feed them. These creatures astound me. They can stop dead while moving at full throttle; they go forward and backward, up and down, and hover to assess their surroundings. They flap their wings fifty times a second, and because of their breathing, heart rate, and high body temperature, they have to feed every ten minutes. Ruby-throated hummingbirds travel two thousand miles from Panama to Canada, five hundred miles of that journey non-stop over the Gulf of Mexico. 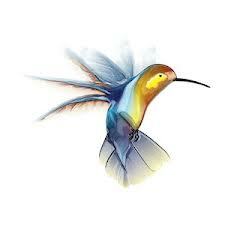 In the Americas, indigenous people have long deemed hummingbirds messengers between the worlds.